Apricots are one of the first fruit of summer. They are an excellent source of fiber and vitamin C. This orange colored fruit pairs well with greens and chicken. You will also find a quick recipe for honey mustard dressing, made from only three ingredients. You won't regret making this delicious apricot salad. If you don't eat too many apricots, you don't know what kind of goodness you're missing out on! Apricots are a natural sweetener, just like in this salad. They are beneficial in protecting you from skin cancer and if you’re looking to eat more vitamin A, (which is good for the eyes, teeth and skin), then apricots are the fruit for you. To a heated skillet, add 1 Tablespoon extra virgin olive oil. Sprinkle a pinch of salt and pepper both sides of 1 chicken breast, sauté until cooked. Cut into bite size pieces. 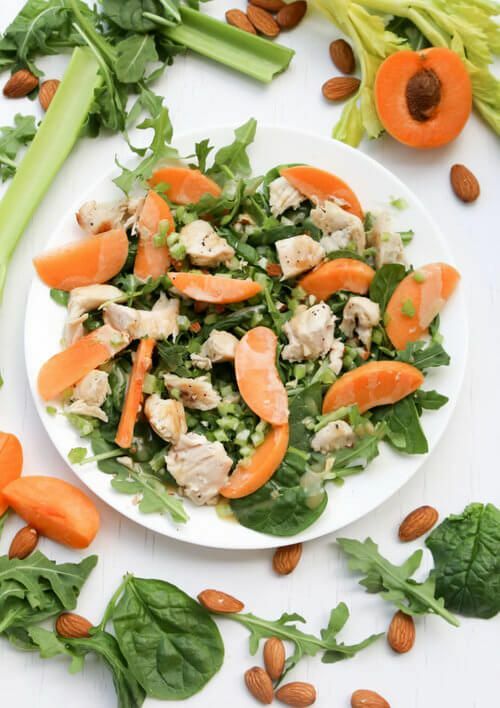 Combine 1 sliced apricot, 1 Tablespoon chopped almonds, 1/2 cup mixed greens, and 1 chopped celery stalk together with the chicken. Honey mustard dressing: Whisk together 1 Tablespoon honey, 1 Tablespoon Dijon mustard, and 1 Tablespoon mayonnaise. Drizzle on top of the salad.